Hunting at Mesopotamia is a unique experience. With 75,000 acres of prime private hunting we provide free-range, safari and helicopter hunts. The original home for the Himalayan Tahr is in the Southern Alps surrounding Mesopotamia Station. Since Tahr were released into New Zealand in the early 1900’s, they have been thriving and the area remains a good source of strong genetics providing some of the best trophy heads in New Zealand. Due to the wild range of trophy animals at Mesopotamia your trip can be focused on hunting in one area without having to travel for each hunt. At Mesopotamia we can offer you accommodation at the Hunters Cottage on the Station, or the opportunity to stay in one of the Station’s mustering huts with your guide, or enjoy both! Guests are welcome to join the farm workers and sample life on a high country station in their time out from hunting. Our guides are able to guide both rifle and bow hunts. They are both experienced operating around the helicopter to assist guests when flying to remote hunting areas. Braden has been working and guiding for Mesopotamia for over 5 years now. He has a passion for the hills, wild game hunting and guiding alike. His calm organised approach along with knowledge of animal behaviour and habitat makes for many successful and memorable hunts. 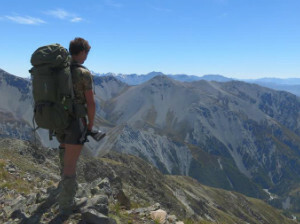 Kurt is a local born Cantabrian and has been hunting in the Southern Alps since he was a young lad. He uses his local experience and huge enthusiasm for hunting to be a great guide for all our guests. Hunting packages can be built to suit you as the individual. They can range from day trips to 4 or 5 day hunts, and we can provide easy access with the Station helicopter. Full guided hunting packages include airport transfers, accommodation, meals and delivery to taxidermist. Contact us with your wish list and we will design your hunt for you.